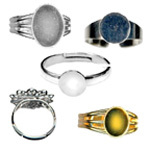 The word ‘Cabochon’ derives from the pre 17th Century French word caboche, meaning head. It describes a gemstone that is shaped and polished in such a way that results in a flat bottom with a convex top. This is opposed to faceted, which creates flat faces on geometric shapes, accentuating light reflection within the stone. 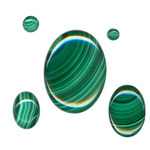 A cabochon gemstone is usually opaque, or if the gemstone is regarded as ‘soft’ and therefore prone to scratches, the stone is usually polished as a cabochon rather than faceted. Traditional cabochon stones are glass, tiger eye quartz, sapphires, sardonyx and hematite. The traditional shape for a cabochon stone is an ellipse (closed curve/oval), as apparently the eye is less sensitive to the asymmetries in an ellipse to that of circles. 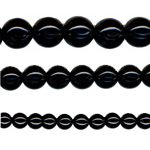 How is the cabochon effect achieved? A slab of rough rock is cut with a slab saw (a traditional saw for cutting large pieces of large natural stone). The stone is trimmed to the desired shape using a diamond bladed trim saw. Wheels with diamond or silicone carbide are used to grind the stone down – the diamond being the preferred tool. The process is completed by hand, known as ‘dopping’. This is where the stone is fixed onto a wooden dowel (dop stick) with hard wax to enable the piece to be ground to the desired shape and the traditional dome shape sanded and polished. How are gemstone cabochons used in jewellery making? 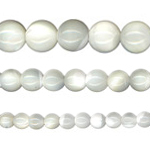 Gemstone Cabochons, with their flat bottoms, have no hole so are not beads. The stone has to be glued or set into a corresponding jewellery findings or setting. 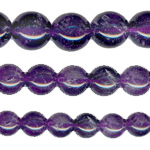 International Craft specialise in supplying high quality cabochon gemstones as well as high quality findings in which to set your pieces, to produce a beautiful item of jewellery. All the tools needed, including pliers and glue are available to enable you to have all your jewellery making requirements in one place. 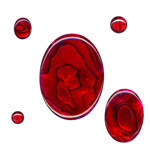 Gemstone Cabochons are ideal for pendants, brooches, cufflinks, rings and earrings.